If you were in Ivan Wallin's anatomy class, you had better be prepared or you would face the wrath of "Mitochondria Man." Instead of lecturing, Wallin simply dissected cadavers during class with his students gathered around the dissection table. As he worked, he fired off questions to the students around him. Students who gave bad answers were whacked in the chest. Ivan Wallin wanted to be only one thing when he grew up: a teacher. The son of Swedish immigrants, Wallin was born and raised in the small farming community of Stanton, Ohio. He attended Augustana College and Princeton University before earning his B.Sc. from the University of Iowa in 1905. Wallin began teaching biology while he pursued a Master's degree at the University of Nebraska (1908) and a D.Sc. in Anatomy at New York University (1915). In 1918, Wallin moved to Boulder, Colorado to become a professor at the University of Colorado Medical School, where he instituted his eccentric teaching style. Wallin was intimidating in the classroom but kind on the outside. He threw frequent parties for his students, and, in return, they helped him build his cabin in the North St. Vrain Canyon, 20 miles north of Boulder. At "Club Wallin," the professor and his students spent the nights playing poker and raiding the padlocked liquor cabinet. During the day, Wallin hunted duck, fly-fished for trout, and built furniture for the cabin. (The students were presumably hungover). The biggest event on Wallin's social calendar was his annual Christmas Glogg party, attended by a hundred guests who were subjected to such Swedish delicacies as Sillsallad (pickled herring salad), lutefisk (dried codfish that has been soaked in a water and lye solution before cooking), and of course, Glogg (a high octane concoction of wine and aquavit, served hot). Wallin entertained his guests with his renditions of Swedish folk songs on the piano. 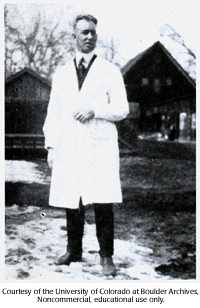 In the 1920s, Wallin tested his ideas about mitochondria in the shed behind the medical school's classrooms. At the time, most people believed mitochondria had evolved from the cell, but Wallin thought mitochondria might be bacteria, because they were indistinguishable by sight. He wrote a series of nine papers explaining his theories and experiments, and claimed in one that he had definitive proof mitochondria were bacteria: he could culture them outside of the cell. No one believed Wallin's cultures were free from contamination, and in retrospect, they were right. It is impossible to culture mitochondria outside the cell, because the instructions for 95% of the proteins it needs reside in nuclear DNA. The heavy criticism Wallin took from the scientific community turned him away from research and he spent the rest of his career in teaching and administration. It was not until after Wallin died that evidence began accumulating that his theory was partially correct.